No matter your credence or creed, nearly every wedding ritual, whether Christian, Hindu or Jewish, involves a processional as a part of the wedding ceremony. Hey, we all like to make an entrance, especially when it's our own party. If you've never been to a Hindu/Indian wedding, you are missing out B.I.G. T.I.M.E. Talk about a party! I'll save the details of the marriage bonanza for another post, but for our purposes today, let's focus on the baraat. Kicking off the often two hour ceremony is the fanfare-slash-parade that is the baraat, or the arrival of the groom and his family, oftentimes atop a horse or elephant. Your husband-to-be would probably love to know that the groom also usually weilds a sword, but this is a detail you are free to omit as, at least for my husband, this is equivalent in danger levels to allowing my 10 month old son to play with newly sharpened scissors. But I digress. Festive, loud and accompanied by drummers, the baraat is reminiscent of a high school pep rally at its finest, evoking excitement and enthusiasm for the matrimony at hand. Not everyone can rent an elephant, but a truly memorable processional would be one accompanied by a lively drum section from your local marching band (think college, not high school). Even better, do it at the conclusion of the ceremony, the cue to begin being your first kiss as husband and wife, leading you down the aisle towards wedded bliss (and cocktails). Spectacular. Here's a video from one of my favorite videographers, Vivid Wedding Films, of an Indian wedding (we hosted the sangeet, or engagement party). Isn't this amazing? Saloni + Sam | Same Day Edit | The Westin, NJ from Vivid Wedding Films on Vimeo. For the first time in my adult life, I feel (almost) cool telling people I was in an a cappella group in college thanks to a little television show called Glee. I attended a college (the College of William & Mary) where being in an a cappella group was (almost) cool, so I totally marvel at the vision of walking down the aisle to a collegiate interpretation of a Billy Joel or Elton John classic. Just picture an all-male, sport-coat-wearing vocal ensemble lining the perimeter of your ceremony, maybe passed off as ushers. I'm thinking Warblers for all you Gleeks. Sigh. I pine for you, Gentlemen of the College. So for all you New York brides, start hitting the NYU & Columbia circuit. You may even be able to pay the group in bridesmaids (I kid, I kid). Okay, here's where I start to get self-indulgent. Once you've planned your own wedding, all bets are off in terms of what you deem appropriate for other people's wedding. This is one of those things. I know this guy, his name is Augie. His grandfather started a fireworks company a long time ago (we're talking drawing a sketch of the show in pastels on a black piece of paper for his clients long time ago). Since then, Augie has evolved the company into a full-scale production company, including concert & staging special effects (he does Glee the Tour, don't you love how this comes full circle? ), fireworks displays orchestrated to music and, wait for it, confetti guns. Yep, a freaking confetti gun. He can load these puppies with all sorts of material. Can you imagine? 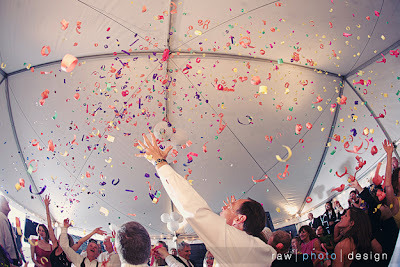 If I were to have a re-commitment ceremony, it would definitely include, among other things (don't rule out an elephant or baraat), a confetti gun. Bold, fun & totally unexpected. Just don't ask me to be on sweeping duty afterwards. The venerable Levy Lighting offers an interactive lighting aisle runner called iShadow. 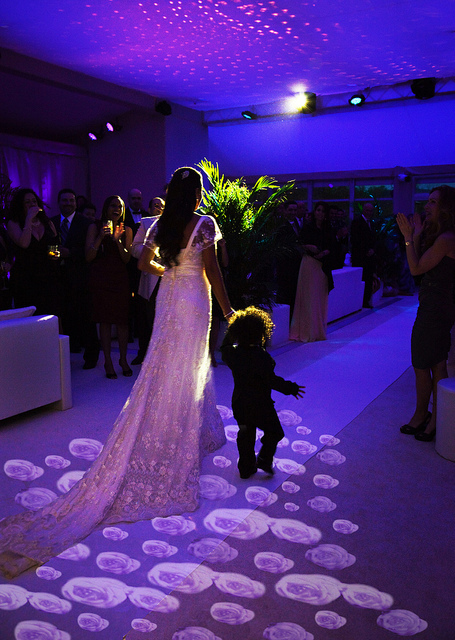 Sensing movement, the iShadow projection can leave a trail of any pre-programmed images in your bridal trail. Think blooming roses, water droplets or exploding fireworks. I fully expect you to incorporate non-instrumentally-accompanied vocal music into your wedding festivities. It's your acci-duty!